The Black Bastards Are Coming © Gordon Syron, 2013 features in a new blog by Curator Stephen Gapps on the Australian National Maritime Museum’s website. The painting re-imagines European contact from an Indigenous perspective. 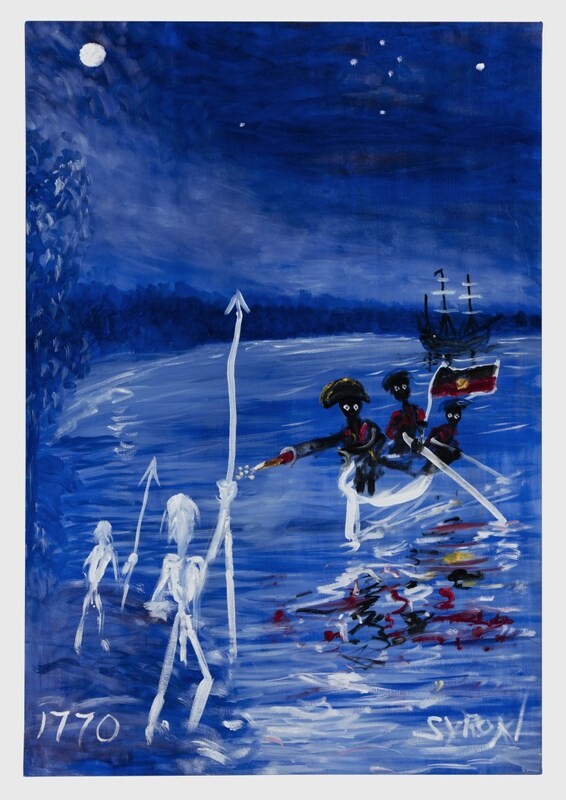 In the work Gordon reverses the roles of first contact by depicting black soldiers in military red coats, approaching shore and firing guns at the white people standing in the shallows. The blog is on ‘Contested waterways – Aboriginal resistance in early colonial Sydney‘ and features works from Gordon and other artists whose pieces are now in the museum collection. The Black Bastards Are Coming is significant in providing a contemporary Indigenous perspective of first contact and European occupation within Australia. It formed part of the East Coast Encounter exhibition as part of an ongoing attempt to provide an Indigenous perspective on Australia’s history. More details about the painting can be found on the museum’s collections website.